ASAP Serve is a local Paradise Valley process server that provides process serving for a number of legal matters. This is a necessary and vital service in the Valley due to the copious amounts of legal proceedings in Arizona, and with help from our qualified, trained process servers, we can quickly and efficiently deliver your legal documents. For the best local process server in Paradise Valley, contact ASAP Serve and learn about our affordable document delivery services! When you need a top rated Paradise Valley process server near you, contact the trusted process servers at ASAP Serve! 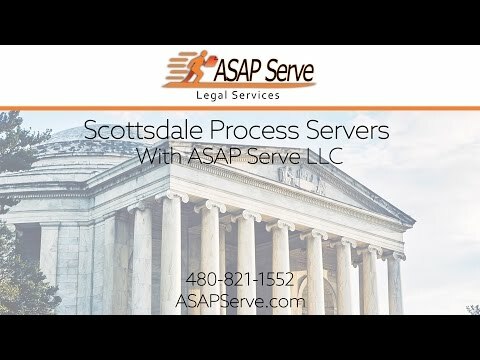 ASAP Serve is a local Paradise Valley process serving company that provides service of process for law firms throughout the Valley. The process servers at ASAP Serve deliver a variety of legal documents in Paradise Valley, including eviction notices. ASAP Serve provides a wide variety of service of process for many legal documents including family court documents, prison serves, and more! "They were able to work with my constantly changing case and would refund my money quickly if something changed and we had to go a different route." "People in the office were very knowledgeable and friendly. Prices are better than others. They do up to 5 try's, others only 3." "I would recommend ASAP Serve for any process serving needs. The online process is seamless." "Would use this particular business again in a "heart beat". Most professional and so quick to accommodate my situation." Court cases are time consuming and stressful, especially when it comes to the paperwork what is often involved with every kind of legal proceeding. ASAP Serve has fast, reliable, and on time process servers in Paradise Valley who can deliver any number of legal documents that need to be transported to the right party in a timely manner. Consult with the top rated process servers in Paradise Valley at ASAP Serve to find out more about our reliable document delivery services. For Paradise Valley process servers who are efficient and affordable, contact ASAP Serve. We provide fast, reliable document delivery of a variety of legal documents including summonses, complaints, subpoenas, family court documents, court filings, writs, and any other legal documents that need to be tracked and delivered quickly and accurately.